Serve this lovely spiced applesauce cake for a special occasion. This festive cake is also a favorite during the holiday season; so pretty and so delicious. 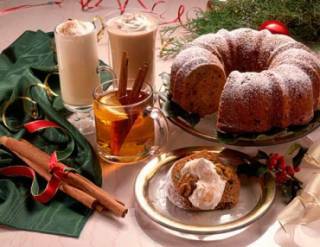 Serve with mulled cider or a cup of hot cocoa, hot tea or a nice warm cup of coffee. Makes a beautiful centerpiece for a special holiday table. Preheat oven to 350 degrees F/180 degrees C. Grease bottom and side of 12-cup fluted tube cake pan with shortening; lightly flour. Toss 1 tablespoon flour and the raisins to coat; set aside. In large bowl, mix 2 1/2 cups flour, the pumpkin pie spice, salt, baking powder and baking soda; set aside. In large bowl, beat granulated sugar and butter with electric mixer on low speed 30 seconds, scraping bowl constantly. Beat on high speed, scraping bowl occasionally, until light and fluffy. Beat in eggs, one at a time, until smooth and blended. Reduce mixer speed to medium. Gradually beat in flour mixture alternately with applesauce until smooth. Stir in raisin-flour mixture and walnuts. Pour into prepared pan. Bake in preheated oven for 50 to 60 minutes or until toothpick inserted in center of cake comes out clean. Cool 10 minutes; remove from pan to wire rack. Cool completely, about 2 hours. Dust with confectioners' sugar and serve with sweetened whipped cream, if desired. A very tasty cake that is good for any occasion.